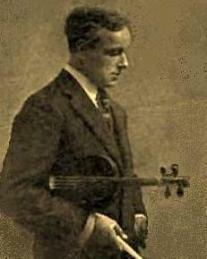 Edouard Dethier (Edouard Charles Louis Dethier) was a Belgian violinist and teacher born (in Liege) on August 25, 1885. Though he was a well-known recitalist and concert violinist for a time, he is now best remembered as a teacher at the Juilliard School of Music, since before it became the Juilliard School of Music. He began his violin studies with his brother Gaston while still a child. At the age of eight, he enrolled in the conservatory of his hometown (Liege), from which he graduated with a First Prize – Eugene Ysaye had studied there also (1865) as a seven-year-old child. Dethier entered the Brussels Conservatory at age 15, winning a first prize one year later (at age sixteen) after entering the Brussels violin competition. One year after that, he was already teaching at the Brussels Conservatory. He was 17 years old. He was then also appointed concertmaster of the opera orchestra of Brussels. During his student days and early career, he was a close friend of Polish violinist, Paul Kochanski. Dethier came to the U.S. (New York City) in 1905, establishing himself as a recitalist and teacher, although he toured for a few years. He played the Vieuxtemps concerto in d minor (number 4) with the New York Symphony on June 6, 1905. On November 29, 1907, he debuted with the New York Philharmonic, playing Bruch’s Scottish Fantasy. He again soloed with this orchestra on December 18, 1910, playing the Tchaikovsky concerto. Gustav Mahler conducted on that occasion. By then, he had already been appointed (in 1906 or 1907 – sources vary) to the faculty of Juilliard – he was 21 years old. As did Ivan Galamian after him, Dethier taught there until the day he died. As far as I know, there are no commercial recordings by him and I also have no idea what violins he played. After 1911, Dethier must have had no financial worries as he had that year married Avis Putnam, the daughter of a famous publisher. Among his many pupils were Julius Hegyi, Robert Mann, Louis Lanza, Emanuel Vardi, Sally Thomas, Genevieve Greene, Julius Schulman, Anna Tringas, Joan Milkson, and Paul Zukofsky. Dethier died (in New York City) on February 19, 1962, at age 76. Emanuel Vardi was a violist who played in the NBC Symphony for some time. As did all violists, he began studying violin and somehow got seduced by the sound of the viola.